This… stuff? Oh… ok. I see, you think this has nothing to do with you. You go to your closet and you select out, oh I don’t know, that lumpy blue sweater, for instance, because you’re trying to tell the world that you take yourself too seriously to care about what you put on your back. But what you don’t know is that that sweater is not just blue, it’s not turquoise, it’s not lapis, it’s actually cerulean. You’re also blindly unaware of the fact that in 2002, Oscar de la Renta did a collection of cerulean gowns. And then I think it was Yves St. Laurent, wasn’t it, who showed cerulean military jackets? And then cerulean quickly showed up in the collections of eight different designers. Then it filtered down through the department stores and then trickled on down into some tragic Casual Corner where you, no doubt, fished it out of some clearance bin. However, that blue represents millions of dollars and countless jobs and so it’s sort of comical how you think that you’ve made a choice that exempts you from the fashion industry when, in fact, you’re wearing the sweater that was selected for you by the people in this room. From a pile of stuff. 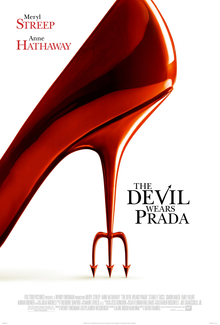 My all time favorite movie is The Devil Wears Prada. If you’ve never seen it, stop right here and go run to your local dvd rental store. I love that this movie can appeal to all sorts of people. My dad will even watch this with me! It’s classic growing up story, set in the ever so fabulous New York City. The fact that fashion is a major player in the film? Well that never hurts any! Miranda Priestly (Meryl Streep) is the boss from hell. Meryl Streep nailed this character square on the head. She is the queen of fashion, quite literally. Where else to get fashion inspiration than from the queen herself? Miranda’s outfits tend to focus on basics, with key accessories. Plain, black shift dress plus long, layer necklaces and sequins that is work appropriate! The sequins works in this situation because it is the major player in the outfit, and it is in a structured jacket. Don’t forget color! This dark purple color is fabulous and would look good on pretty much anyone! Darks tend to be neutral, letting you mix them with lots of things. This outfit included a corresponding colored pump, in a slightly different shade of the same color. Add a pop of turquoise with a ring and you are good to go! Powerhouse. But really, Miranda Priestly is a power house and this outfit shows she’s ready to get down to business. She mixes it up with a striped skirt (I went with a heathered pattern) but keeps the rest of the outfit simple. Working in a creative field? Try some colored shoes to top it all off. An orange necklace and a red belt. A combo I would probably never try had it not been for this movie. This is again, a super simple outfit, but the accessories keep it interesting! I would probably opt for a skinny red belt (I think a red one would overwhelm me!). Don’t forget the shades! Sick of the white button down and pencil skirt combo? Try a wrap top! Keep it white, and add some interest with a simple necklace. This would be a great, I’m running ten minutes late and don’t know what to wear look! I love how simple, but yet dramatic Miranda’s looks all are. It really is all about the attitude. Now I want to know! What’s your favorite movie to get fashion inspiration from?